UNITED NATIONS, February 16 -- Friday evening from the UN's basement by the East River emanated the sounds of the ritual kissing of the ring. Ban Ki-moon made an appearance, to present in person his proposal to split the Department of Peacekeeping Operations in two, and modify the disarmament affairs unit. 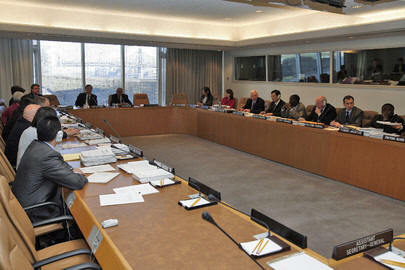 As initially proposed, the changes were connection: eliminate one Under Secretary General slot at Disarmament, to create a new one with the Department of Field Support. But dissention about the downgrade has led Ban Ki-moon to now say that Disarmament, though renamed, will still be USG. In the hallway outside Conference Room 2, Pakistan's Ambassador Munir Akram said he expects Ban's disarmament proposal to move quickly now, while the peacekeeping split is still uncertain, and depends on meetings in the next week, on how the issue of "unity of command" is addressed. Amb. Akram points out that when UN peacekeepers need reinforcements, they shouldn't have to work through two department. The ring-kissing wasn't just Mr. Ban's personal appearance, rather than like last time sending chief of staff Vijay Nambiar. It was also what allowed Amb. Akram to said, he will go to the Fifth Committee and to the advisory committee ACABQ. In the hallway a diplomat from the Middle East who proceeds only anonymously as he is not authorized to speak, said, "What a waste of time. There are people dying in the world, and we spend weeks talking about a supposed reform that makes no difference at all." Mr. Ban in ACABQ: but where is the ring? Japanese Ambassador Kenzo Oshima, also in the hallway, used the buzzword of the day: revenue-neutral. He said that now probably another USG-level position has to go, and added that he hopes it's not OCHA, the Office of the Coordinator for Humanitarian Affairs. "So does John Holmes," replied one wag, referring to the British diplomat already given that USG slot. Mr. Holmes did a meet-and-greet with UN correspondents on February 15, but his spokeswoman insisted that everything said was off-the-record. Alright, then. Room 226 it is, then. Just as baseball has its spring training, when the games don't count, a new UN official can in the first encounter stay entirely off the record. But then the season starts and the curveballs have more break to them. Inner City Press: The Council of Europe today announced that the US has refused to allow it to visit Guantanamo, and it said that it had to go with the UN Special Rapporteur on Torture, Manfred Nowak. So, has he also been denied once again access to Guantanamo Bay? Spokesperson: I can check. He had been denied before, but I can check if this is the case this time around, yes, I�ll find out for you. Inner City Press: One other thing. At the stakeout yesterday, Mr. Ban said that he has a shortlist for the Special Adviser to the Secretary-General for the Prevention of Genocide. Is that shortlist going to be released at some time? Spokesperson: I don�t know at this point. I�ll let you know. Among the flotsam and the jetsam of the week at the UN, among the hallway stories, is the perhaps urban legend of Ban Ki-moon yelling at the head of Disarmament. As the yarn has it, he criticize the proposed downgrading and Mr. Ban expressed dissatisfaction, to be diplomatic, at the breach in the chain of command. Many, particularly the large Japanese press contingent, want to nail the story down. But some rooms in the UN tell no complete tales. These rooms are few, but they do exist. They do not, however, include Conference Room 2. The aforementioned press pack descended like locusts or a well-trained scavenger team on the papers left on desks at meeting's end, trolling for a reason, any small squib to explain. Sadly, all that was left was one diplomat's cell phone, which a guard held on it, hoping it would right. For weeks, the name Jonathan Blankson had been in the air: an IT professional fired for using a fake diploma, an Internet university, a sham curriculum vitae. AP wrote it, first it must be said, but without the irony that Blackson invented, or at least rode herd over, the UN's "Galaxy" system, through which people apply for jobs. So the processor of resumes had a bogus one himself. There's more to the story, but this week that's enough. 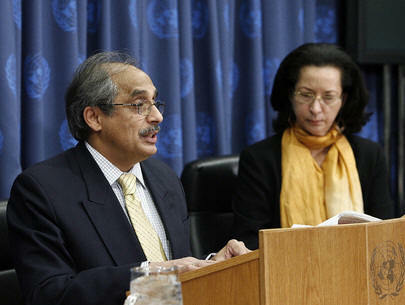 UNITED NATIONS, February 8 -- At the UN, even the word "migration" has become controversial and is being worked around. Iran's deputy Ambassador, Mehdi Danesh-Yazdi, responding Wednesday to Inner City Press' question about migration for employment, said that the UN Commission on Social Development, which Iran chairs, has decided to avoid the word "migration." Instead they use the phrase, mobility for labor. But what's in a word? Barbados Central Banker Marion Williams said at the same event, in response to Inner City Press' questioning of why in Barbados there are six commercial banks, and 57 offshore banks, gave a long explanation about the mobility of capital, and the need to labor, and laborers, be more mobile. Migrate, do you mean? Video here. Wednesday Inner City Press asked the Office of the Spokesperson about reports that the UN's Deputy SRSG Ivo Petrov was told that the Abkhaz side would not attend upcoming talks in Geneva. Minutes later, a spokesman responded that there will be Abkhaz representation at the talks. This hearkens back to a threat never followed through on, by Russia to file complaints about the U.S. blocking the visa request of a Georgia-designated official for Abkhazia during last Fall's General Assembly, based on extraneous concerns. At the time, Russian Ambassador Vitaly Churkin said he would be filing a complaint. But this appears to never had happened. The Abkhazia issue also arose Thursday at the UN, as Martti Ahtisaari briefed reporters on his draft status proposal for Kosovo. Mr. Ahtisaari called Kosovo "sui generis" and distinct from Abkhazia, South Ossentia, Transdniestria, and Nagorno-Karabakh where, he said, separatists hardly need a Balkan precedent to do what they are going. Inner City Press asked Mr. Ahtisaari to explain a quote of his in The Guardian, that "Failure to act would lead to 'a weakening of the security situation' and a possible withdrawal of Nato peacekeeping troops, he said. 'If I was advising my government I would say to pull out.'" Mr. Ahtisaari explained that in the course of a long interview, he was thinking not of a possible veto -- if it comes, from Russia -- in the Spring of 2007, but of longer-term delay. Video here. Meanwhile it is predicted to Inner City Press by informed sources that the current Russian thinking is to abstain, and not veto. We'll see. Connecting this items is a simple economic analysis: as other countries have entered the European Union, those still outside find their ability to travel -- their labor mobility, so to speak -- increasingly curtailed. This harms their economic prospects in ways that the World Bank and IMF, which Mr. Ahtisaari stresses, are unlikely to make up for. Inner City Press: There�s a report of quote hundreds of protestors in front of the UN DPKO in Haiti. So, I�m wondering, I don�t know, there have been reports of this and we haven�t seen any statement by MINUSTAH. One, is that the case, and two, if so, the report quotes a protestor saying the UN is part of the cause of the violence. So, obviously, are you aware of that, and can you comment on it? Spokesperson: Yes, we are aware of it, but we cannot comment on it at this point. There have been demonstrations over and over again for quite a few weeks now. It�s nothing new, and nothing particularly that the Mission is reacting to. Inner City Press: You were here when Mr. Mulet said that everyone wants the UN in Haiti. Obviously, it�s not everyone, but what percentage is it? Does the UN see the protest as representing an important part of Haitian public opinion or not? Spokesperson: Well, we have no way to assess that. The Mission has not informed us of percentages. Inner City Press: Well, I was wondering if you are willing to� what do you think? Spokesperson: I have absolutely no personal opinion� my personal opinion will stay with me, if you don�t mind. Inner City Press: I guess, just to follow it up. If they do say something, maybe you could give me what they said here, or highlight it in some way, if MINUSTAH has some response to these protests? Spokesperson: Definitely, Matthew, I will. As soon as we get an answer from them, we�ll inform you. Inner City Press: And, on the Secretary-General�s schedule, Josette Sheeran is becoming head of WFP. Is she still in the building? Is there some way to get an opportunity, either at the stakeout or some other way, to ask her some questions? Spokesperson: We tried to have her, but, unfortunately, her schedule did not allow her to come, so that�s why. We did try this morning. Inner City Press: When was she, has there been a change in her start date at WFP? Spokesperson: No, nothing has been changed. Still the same. We'll see. It's been noted to Inner City Press that Ann Veneman, as she was entering UNICEF, did a stakeout interview. In the months since her controversial selection to head WFP, Ms. Sheeran Shiner hasn't taken any question at all. What, as simply one example, is her view on whether internal audits of WFP should be available to member states, the Executive Board, the press and the public? 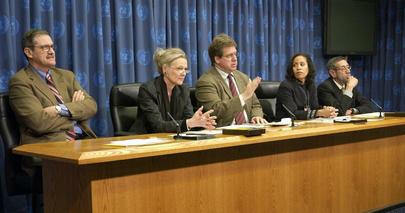 We'll see -- WFP has of late been responding to questions with answers, watch this site. Click here for Inner City Press' fourth story on the UN Pension Fund, whose CEO has refused to act on an OIOS investigative report, triggered by the complaint of a whistleblower who gave an exclusive interview on Thursday night, click here to view.